what can you expect from this article ? Well, certainly not what you can find somewhere else. Simple to understand instructions on how and where. Creating processing files ( pp3 ) for pré programming certain processing adjustments like exposure correction, sharpening etc. And as Trey Radcliff likes to say, it will be a “living document”, so I will complement this article in time. Later, when complete, I will publish the article in the workshop menu, where its more easy to find. 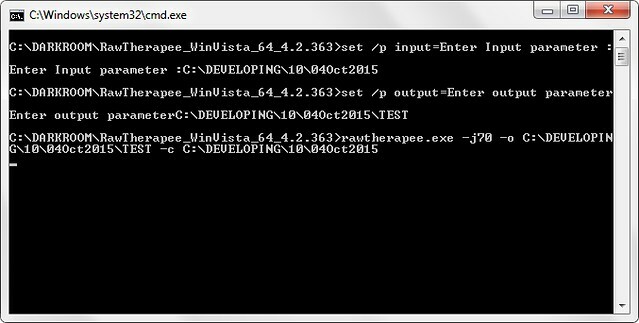 But, its much easier to use a batch file placed in the root of the RawTherapee folder ( the root is where the rawtherapee.exe is ), then u only need to start your batch file with rawtherapee.exe folowed by developing parameters. This will develop all DNG files in a certain folder to Jpeg, with 70% compression, with default parameters, to a certain folder. Because we need to change input and output folder, we need the batch file to ask us the path of both folders. This is done by using the “set /p” command. Ok, enough theory, lets set this into practice. If you’ve done everything right, RawTherapee will start. This is just to make sure you’re on the right track. 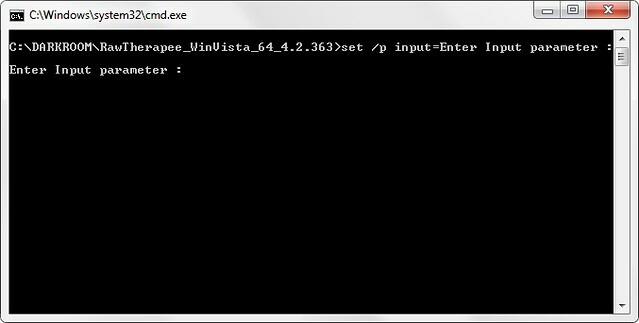 Then open the batch file again with a right mouse click and choose edit. Save and double click the batch file. In this window you can follow the development of each RAW file. When the developent is finished, enter any key to close both open windows. Now, you will find the developed Jpegs in the given folder. If the program didn’t start, and it did in the first step, then you have probably made a typing mistake in one or both input/output path’s. Start over until you get it right and working. If it did work out just fine, you have made your first programming. Having this first step done, next programming will be much easier to understand and to follow. 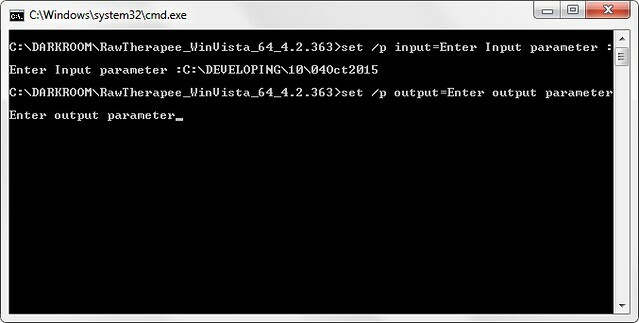 Next step will be a simple interactive batch file with more parameters to define. With the “set /p” command, we can virtually insert any command or option that is possible in RawTherapee. It would be possible to write just one program line, that could perform any command. But you also would need to enter a lot of parameters, and that would make it complicated. The best option is to create one or more batch files that fit your purpose, or to create one fully interactive batch file, just like my RawBat. Ok, now a series of script possibilities, starting with the Jpeg from before. and the batch script cannot work with spaces in filenames. therefore, make a copy of the file and rename to Natural-1.pp3 for this example. For any other profile you want to use, make sure the characters are connected ! add “@echo off” at the start of the script.